Find somebody who's already done it to look over your shoulder. Join the local Electric Auto Association and find yourself a mentor! Being fairly lightweight. Reverend Gadget at Left Coast Electric swears he can convert everything from a Hummer to a snowmobile, but then, he's the good Reverend Gadget, who's been converting gas vehicles to electric since Ben Franklin first got the dotty notion to fly his kite in a thunderstorm. You'll get most bang for your battery buck if you think "light and aerodynamic". Not a rust-bucket. You're going to go to a certain amount of trouble and expense when you build your own electric car... so why put new guts into a rotting hulk? Not being so exotic that you'll never find replacement brakes except on e-bay. My uncle Chuck converted one of the first Subaru trucks (I didn't even know Subaru made trucks, did you?) to electric - picked it up for a song without a working engine. Great donor, right? No. 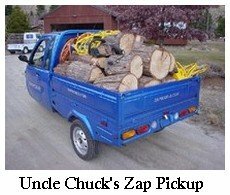 Update: Now Uncle Chuck's got a new Nissan LEAF. When you build your own electric car, it's a good idea to get yourself a conversion KIT. the costs are reasonable - they won't charge you an arm and a leg for a conversion kit. 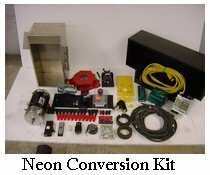 When you choose a conversion kit, the first decision will probably be between an AC or DC motor. Here's a discussion of the pros and cons of AC and DC motors, and why I favor the AC motor for conversions. Cultivate a relationship with a machinist when you build your own electric car. Unless you ARE a machinist, of course, and have all the large machining tools in your garage, you're going to need one. The transmission adaptor plate and the assembly that fits motor to the transmission requires precise machining or you're going to be very unhappy with your conversion for as long as it lasts. Get somebody else to yank out the engine. In every town are businesses that are skilled, experienced, and well-equipped to pull 700 pound engines out of automobiles - called auto repair shops. Let them do it. It costs a few hundred bucks, and it's money well spent. 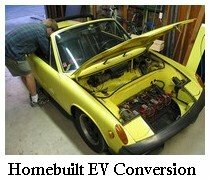 The EV Photo Album, where people post pictures of their conversions and links to their blogs. Blog. Somebody out there will really appreciate the opportunity to learn from your experience. Especially your mistakes; the best EV blogs are the ones where people are brave enough to admit they messed something up or didn't understand something right. If somebody helped you build your own electric car, your EV blog pays it forward by helping the next guy. YouTube. A surprising number of excellent YouTube videos have been made by people converting their cars to electric - you can find them by searching for "electric car conversion" (or similar) on YouTube. Here's an electric Suzuki Samurai series that I particularly like. Don't bother with the ones that show you how to run your car on water for less than $500, btw...I know, I probably didn't have to say it, but the scam makes me mad. Paul built this electric car for about $2000. Have you been wondering how to winterize your electric car? No problem.